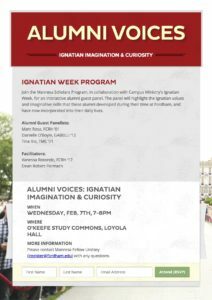 Ignatian Week Events & Raffle! 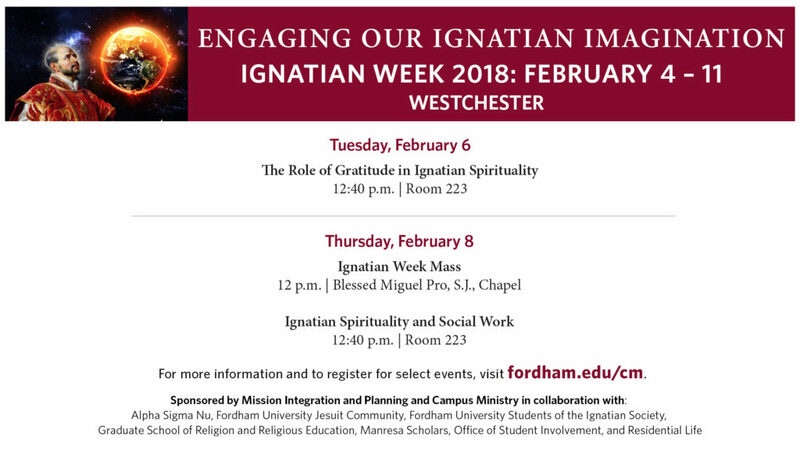 Ignatian Week celebrates the rich heritage of Fordham’s Jesuit mission and the ways it is alive and thriving at Fordham today. How does our Ignatian tradition encourage us to envision a more just and loving world? 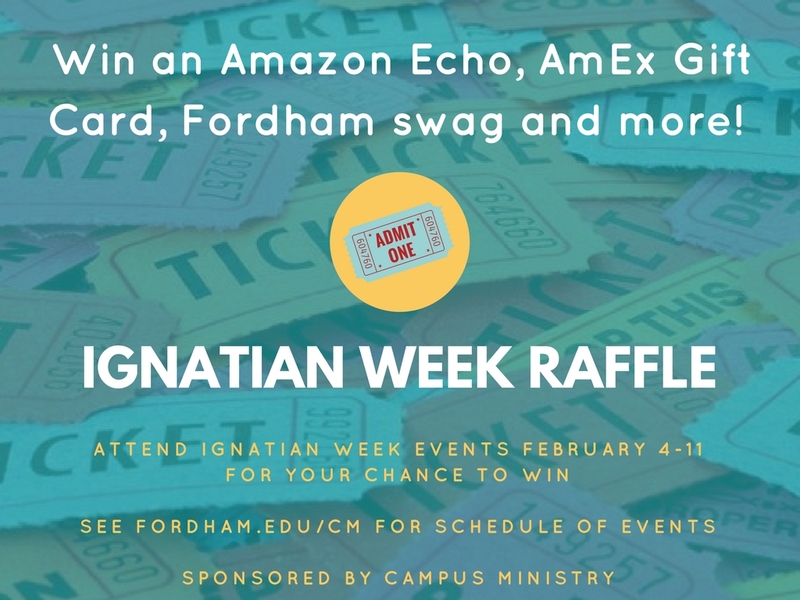 Ignatian Week events participants will be given raffle tickets at each event for a chance to win great prizes including an Amazon Echo, AmEx gift card, Fordham swag, and more. The more events you attend, the better your chance to win! Check out the full schedule of Ignatian Week events, which includes a list of how many raffle tickets you receive at each event! 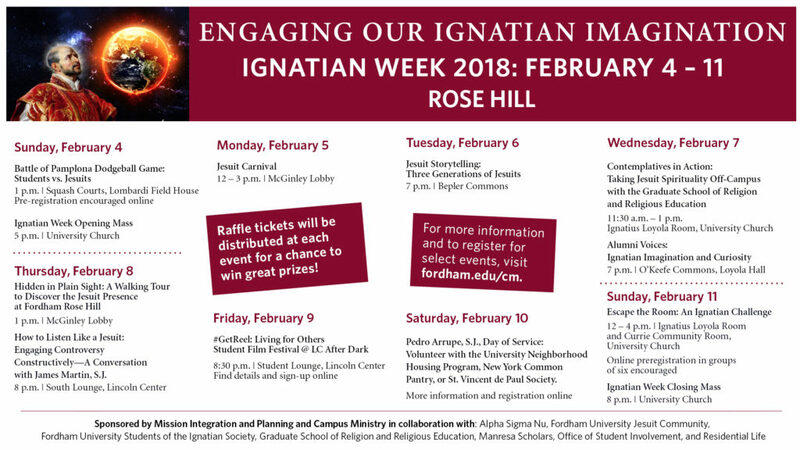 See the full schedule of events for opportunities to engage your Ignatian imagination (and win some great prizes)! 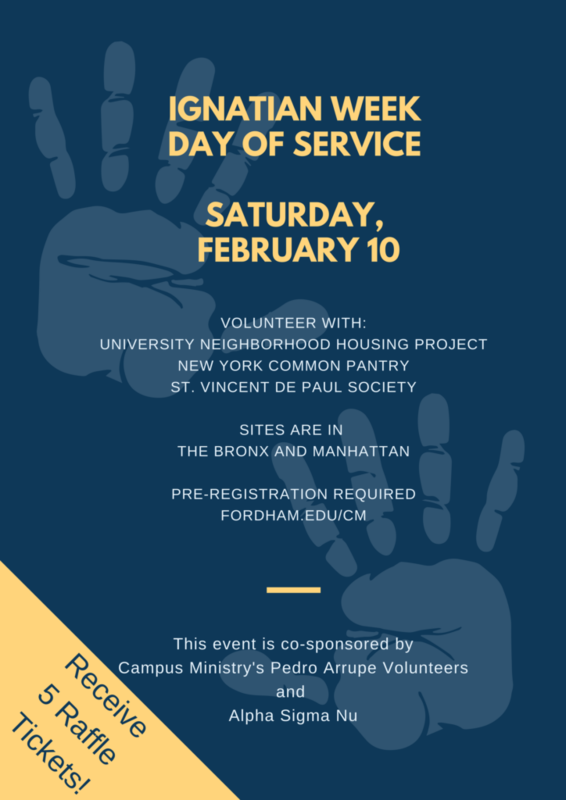 Contact CampusMinLC@fordham.edu for more information. Join Fr. James Martin, SJ in an interactive conversation on how to engage controversy constructively – both in social media and our daily conversations. Come with your questions and examples from your own experience! 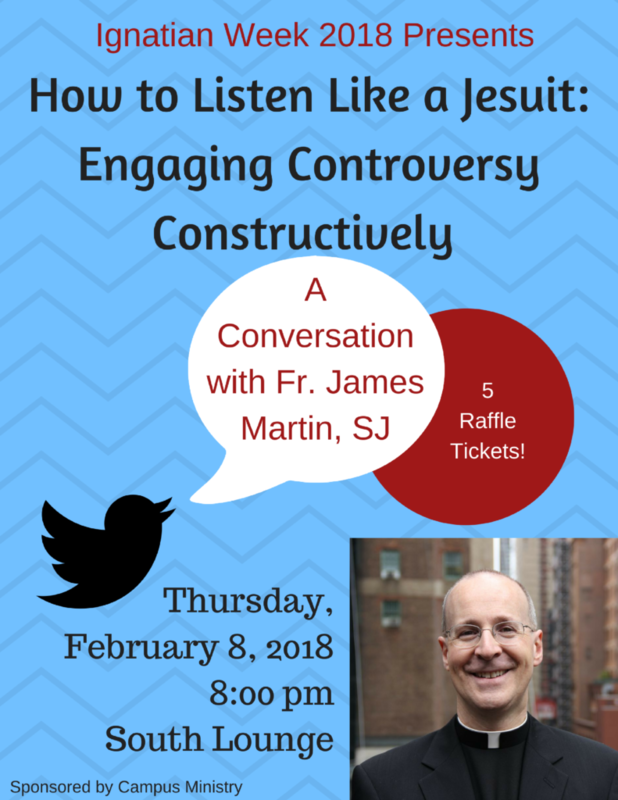 Thursday, February 8th | 8:00 p.m.
James Martin, SJ is Editor-at-Large at America Media and author of several books including, Building a Bridge: How the Catholic Church and the LGBT Community Can Enter into a Relationship of Respect, Compassion, and Sensitivity. A limited number of copies will be available for purchase. Participants will receive 5 raffle tickets for a chance to win great prizes such as an Amazon Echo, AmEx gift card, Fordham swag, and more! 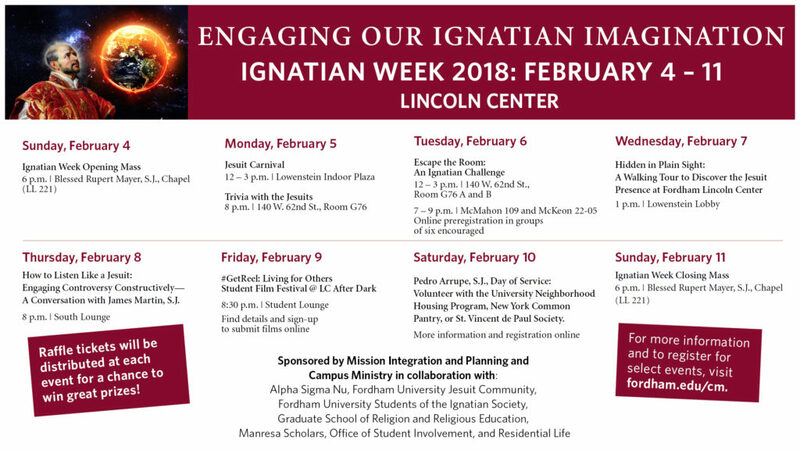 Check out the full schedule of Ignatian Week events! Celebrate Ignatian Week by participating in a day (or half day) of service in our local communities. 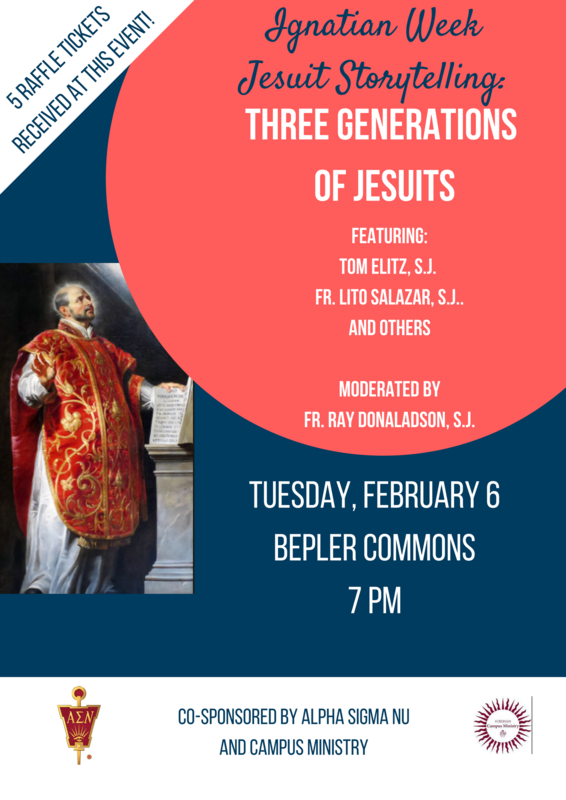 Listen to the stories of 3 generations of Jesuits from the Fordham community and ask them questions in this interactive conversation. Tuesday, February 6th | 7 p.m. Participants will each receive 5 raffle tickets for a chance to win great prizes such as an Amazon Echo, AmEx gift card, Fordham swag, and more! #GetReel: Living for Others Student Film Festival – Call for Submissions! What does “Living for Others” mean to you? Or what would you like it to look like? 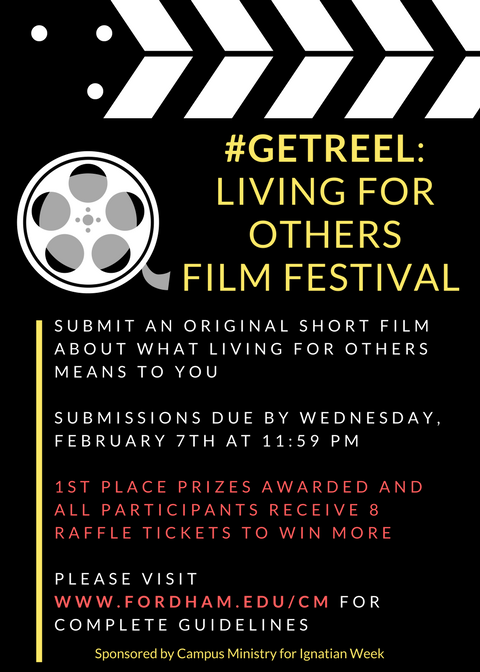 You’re invited to show us by participating in this year’s #GetReel: Living for Others Student Film Festival, which will take place Friday, February 9th at LC After Dark as part of Ignatian Week. Please see the call for submissions and event guidelines below. Submissions are welcome from students of any campus. The most important things are to have fun and no prior film experience is required! 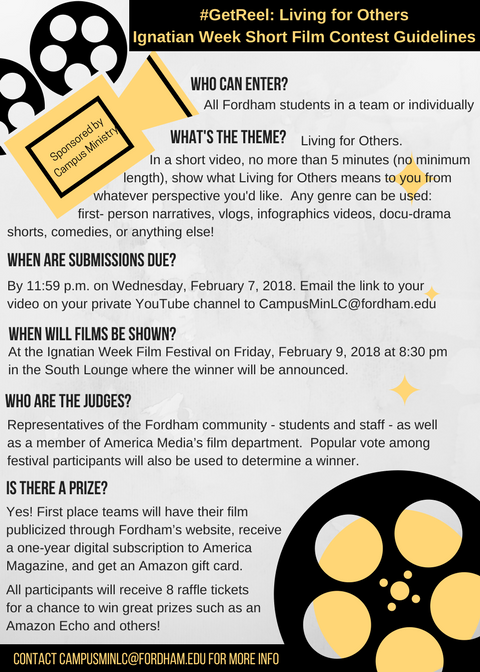 All those who submit films will receive 8 raffle tickets for a chance to win great prizes such as an Amazon Echo, AmEx gift card, Fordham swag, and more! All are welcome to view the films at the Film Festival on Friday, February 9th at 8:30 p.m. in the Student Lounge at Lincoln Center. 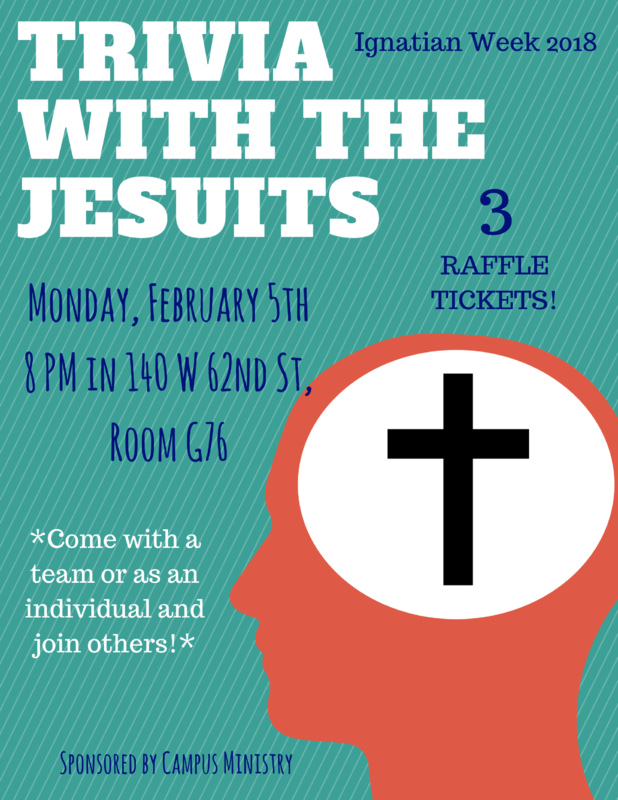 So you think you know about the Jesuits, Fordham, and our university mission? Put your knowledge to the test and learn new things in this interactive trivia competition complete with 4 quarters of play and several intermission challenges. Come with a team or as an individual and join others! No pre-registration required (or even available). Participants will each receive 3 raffle tickets for a chance to win great prizes such as an Amazon Echo, AmEx gift card, Fordham swag, and more! A lunchtime panel discussion on Jesuit spirituality outside the classroom. Our speakers will share their experiences bringing their Ignatian spirituality into various work settings. Moderated by Francis X. McAloon, SJ, Director of the Doctor of Ministry Program at Fordham’s Graduate School of Religion and Religious Education. Lunch will be provided. Wednesday, February 7 | 11:30 a.m.- 1:00 p.m. Participants will receive 2 raffle tickets for a chance to win great prizes such as an Amazon Echo, AmEx gift card, Fordham swag, and more! See the full schedule of Ignatian Week events! Join the Manresa Scholars Program, in collaboration with Campus Ministry’s Ignatian Week, for an interactive alumni guest panel. 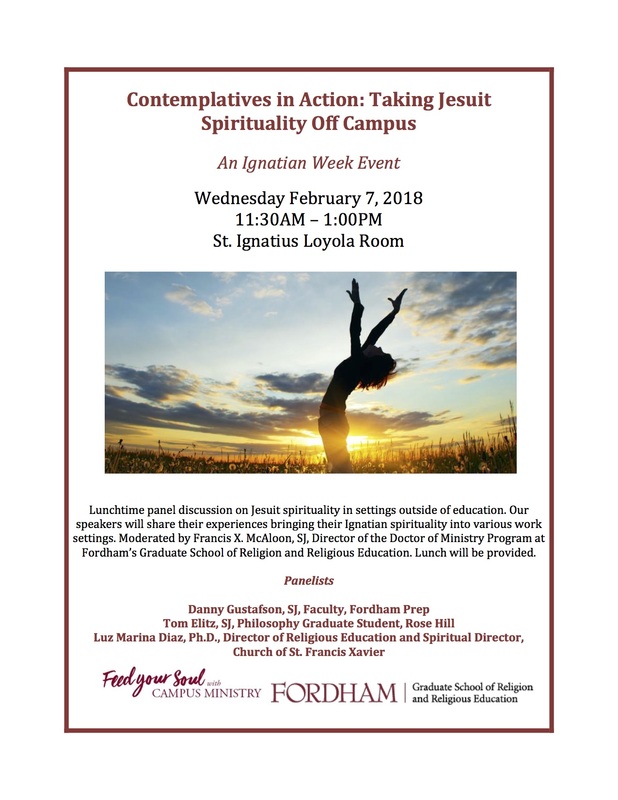 The panel will highlight the Ignatian values and imaginative skills that these alumni developed during their time at Fordham, and have now incorporated into their daily lives. Participants will each receive 2 raffle tickets for a chance to win great prizes such as an Amazon Echo, AmEx gift card, Fordham swag, and more! 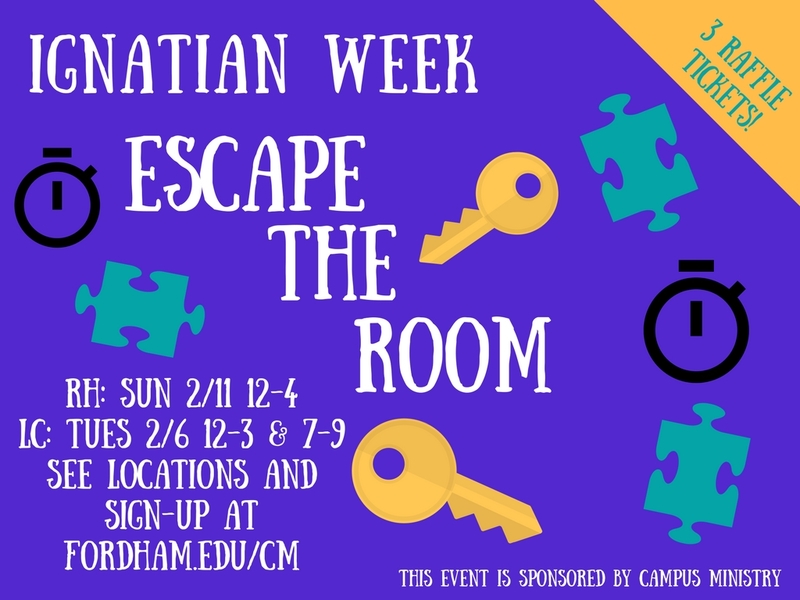 Work in teams of 4-6 to solve a series of challenges and puzzles to decode the cipher that unlocks the door so you can Escape the Room in this Jesuit-themed challenge! Escape the Room will take place at both Rose Hill and Lincoln Center. Each participant will receive 3 raffle tickets at this event for a chance to winan Amazon Echo, AmEx gift card, Fordham swag, and other great prizes! Do you think you know all there is to know about Fordham because you’ve been on an Admissions tour or have been in every building on campus? See Fordham from a new perspective! 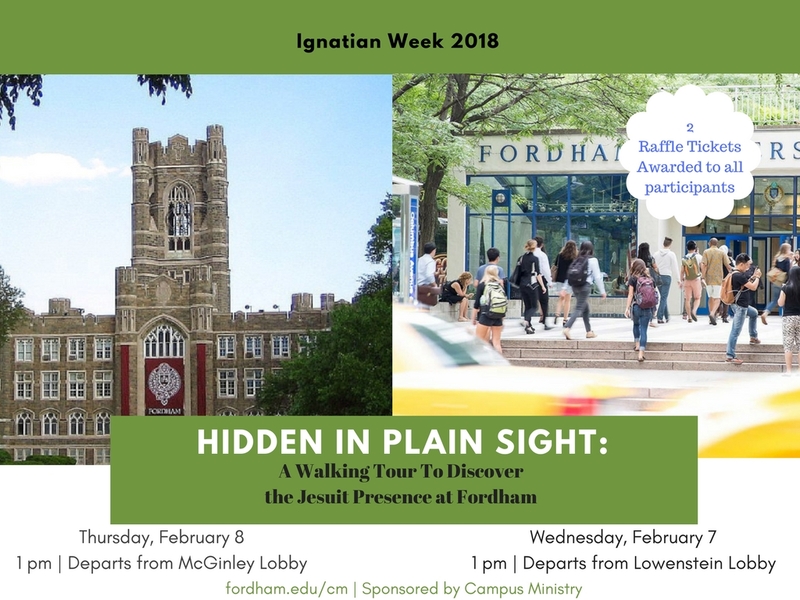 Join Bob Reilly, Assistant Dean of the Feerick Center for Social Justice, for a walking tour to discover the Jesuit presence at Fordham. Wednesday, February 7th at 1 p.m.
Thursday, February 8th at 1 p.m. Registration encouraged but not required. Participants will earn 2 raffle tickets toward a chance to win an Amazon Echo, AmEx gift card, Fordham swag, and other great prizes! See the whole Ignatian Week Calendar here!